The Water Wielder Mouse is a breed of mouse found in The Mad Depths zone of the Iceberg. It is known to drop Hunting Research, Satchel of Gold, Sticky Charms, and Wax Charms as loot. 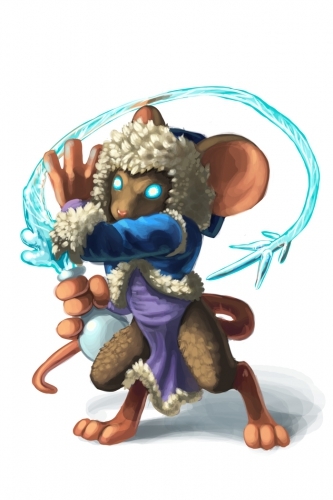 Long hours of practice and concentration have given this mouse the ability to use water itself as a weapon, forming it into long spears of ice which he can then use to safely pry cheese loose from any trap – or even inflict terrible damage to a hunter's courage! Water Wielder mice have no specific preference for any kind of cheese. The encounter rate for Water Wielder mice can be decreased by arming the Hearthstone base. The Water Wielder mice were released on 24 May 2012 with the opening of the Iceberg location. They began to drop loot on 1 June 2012. This page was last edited on 29 June 2014, at 21:48.